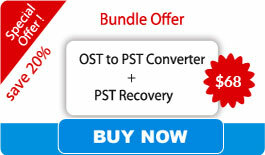 The OST to PST Converter is an efficient, highly developed algorithms application built with the ability to recover & scans the corrupt or damaged OST file and further saved in a PST format output. Convert OST to PST software is the most constructive desktop/laptop data conversion & recovery utility which is for all time available for you. Scanning options: Advance scan and Quick scan. Import OST file to PST, EML, MSG, Office 365 and HTML. 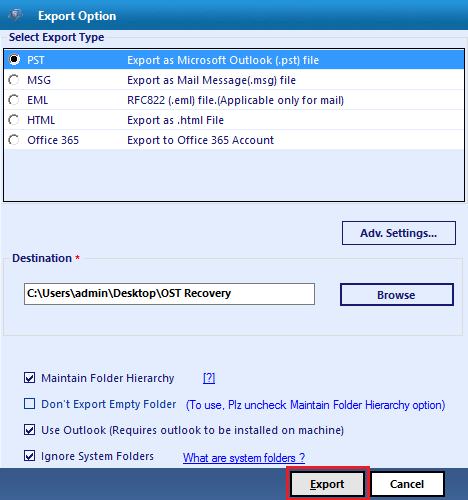 Software supports Exchange OST, Office 365 OST, Hotmail OST and IMAP OST. Date range filter to export selective items. Export selective items from the OST file. Decrypt and remove S/MIME and OpenPGP encrypted OST emails. User can save & load previously scanned file. Option to Split PST resultant PST file. Loads preview of items like OST file emails. 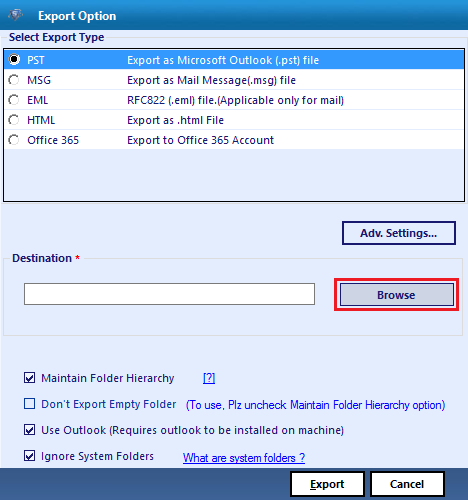 Tool to export file as PST format without the need of Outlook installation. Displays a live view of the export process. Meta data kept intact throughout the conversion. Software Support Windows 10 (both 32bit,64bit) and all below version. OST to PST Converter Demo version allows exporting 25 items per folder. OST files are nothing but the replica of Exchange Server mailbox data. When Outlook is configured with Exchange server in cache enabled mode, Offline files are created. The most common issue encountered by the users working with Offline Files is the synchronization failure. Also, other reasons like; deletion, recreation and relocation of mailbox, etc., make OST file inaccessible. For accessing the data in Offline file it is necessary to synchronize with the Exchange Server. But the issue arises when you cannot connect to the Exchange server. In such a scenario, the dependency on server can be cut off by Convert OST to PST Outlook, i.e. recover exchange ost file and the data can be accessed individually. The Exchange OST Converter is renowned globally owing to its efficient recovery feature for corrupted OST files and versatility to save the Offline file in different formats to broaden its accessibility over platforms other than Exchange Outlook. Win2000,Win7 x32,Win7 x64,Win98,WinServer,WinVista,WinVista x64,WinXP,Win8,8.1, Windows 10(32bit, 64bit). I permanently deleted some of my emails in Outlook a few days back. I need them now but can't figure out a possible manual method to do so. Can the software recover permanently deleted mails also? Yes, the software can completely recover even the permanently deleted items from Outlook. 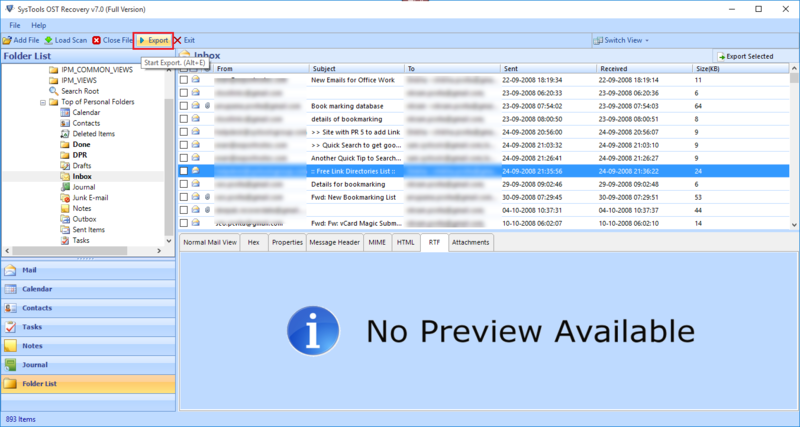 The tool will recover deleted mails only if you have not compressed the PST file in which your emails are stored. I have Outlook 2010 installed in my machine and I want to extract an OST file of Outlook 2002 version. Is he recovery possible? Yes, the software can extract the OST file of Outlook 2002 version. The recovered PST file will be in UNICODE format that is supported by Outlook 2010. Will the software preserve the metadata of emails and the original format as it was in the previous Outlook file? Yes, the software will preserve all the metadata in emails like To, From, Cc, etc. Also the original formatting of the data will be kept intact. "The plight of OST file corruption has completely made me helpless as it contained important emails which I wanted to access urgently. I was looking for suitable solution that would enable me to recover back the OST files when I came across your product. The tool really brings out a commendable job in recovering all the OST items in PST file format." "As OST files are MAPI based, I was not able to import those files in another Outlook profile. But the OST to PST converter tool made my job easier. 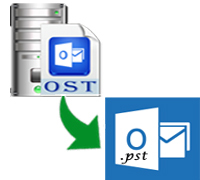 I was able to convert the OST files into PST and later import those files to another Outlook profile."